Learn from critical data extracted from 259 incubation programs worldwide – and learn how your program compares while identifying areas for improvement! The UBI Global 17/18 World Benchmark Report is the most comprehensive benchmark study of university-linked business incubators and accelerators. The vast amount of data collected and the insights derived will give you a worldwide perspective and identify which qualities make a top incubation program successful. With data from 259 business incubators and accelerators in 6 regions and 53 countries, this report is the most comprehensive comparative study of university-linked incubation programs worldwide. In the new edition of this unique report, over 1,300 programs were assessed of which 822 were deemed qualified, and a final 259 vetted group provided and completed the different stages of data verification and were included in the benchmark process. This 72-page report measures incubation programs using the updated UBI Global framework with 21 key performance indicators that consider both impact and performance dimensions for the scoring mechanism. 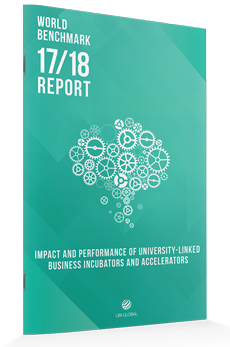 World Benchmark 17/18: Impact and Performance of University-Linked Business Incubators and Accelerators is the latest report from UBI Global, a pioneer in measuring and analyzing the impact and performance of university-linked business incubators and accelerators. We stand 100% behind the quality and value of this unique incubator and accelerator resource. If you are dissatisfied, simply let us know and we will send you an immediate refund of your entire order.